Math Skills: Doubling a recipe requires addition (or multiplication) skills, halving it requires division, and recipe fractions like ½ cup and ¾ teaspoon bring math applications into the kitchen. Often, kids don’t recognize they are practicing math! Comprehension: Reading and understanding step-by-step directions, adding ingredients in sequence, and techniques such as folding and blending, are all important components to yielding the finished food product. Helping your child fine tune his reading comprehension skills at the same time doesn’t hurt! Real Life Science: Cooking is a science experiment. Too much salt, baking powder, not enough flour, or the wrong timing and you’re likely to have a flop on your hands. 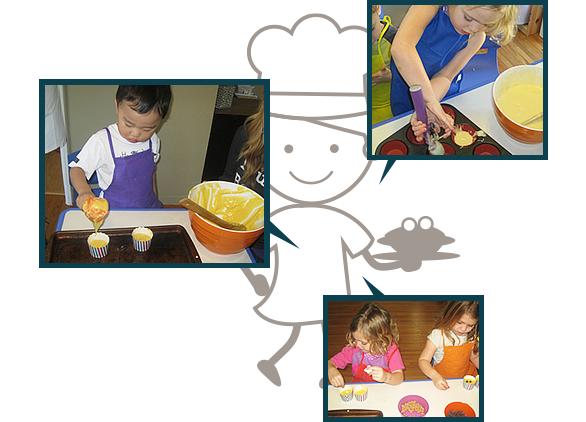 Cooking provides an opportunity for kids to get hands-on experience with basic science. Communication: A relaxed atmosphere in the kitchen offers an opportunity to talk, about anything! Parents can take advantage of this, especially with teens, as communication is a key element to raising a well-adjusted, healthy child. Fun! Last but not least, cooking is fun! Having fun with your child in the kitchen builds positive memories, good vibes, and good food.